with other strategies since 1997. Money Market. The most "conservative" investment risk strategy. formulaic asset allocation (FAA) investment approach. A TDF is a blended stock and bond mutual fund classified as "moderate" or "balanced" investment risk. 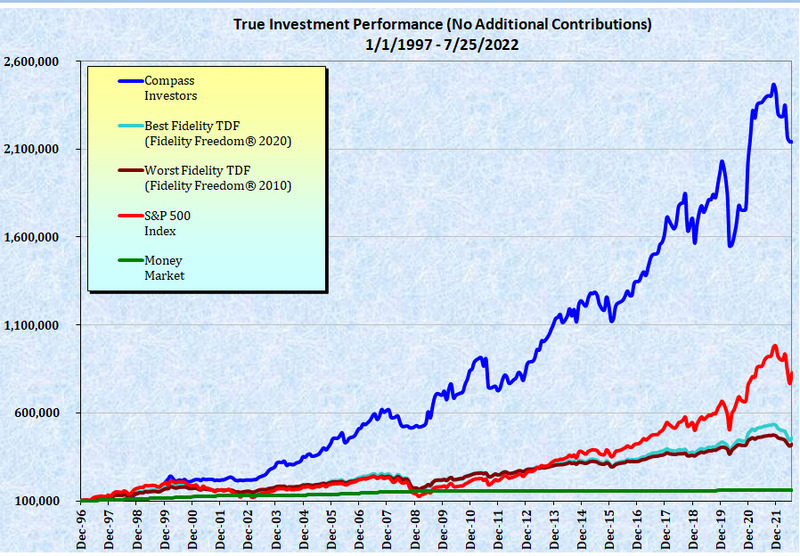 Fidelity's funds are chosen as they one of the largest providers of TDF and have offered these products since 1997. S&P500 (Dividends Reinvested). Wall Street's best indicator, representing an "aggressive" investment risk strategy. HORIZONTM Adaptive Asset AllocationTM*. The back-tested blended performance of all supported plans. Click to see how HORIZONTM performed for YOUR fund collection. NOTE: Click on the graph to enlarge. * Our objective process and calculation of results were independently reviewed by Ashland Partners and Company, LLP in 2006. The HORIZONTM computer model has remained unchanged and the results for the period shown are simulated. Actual performance may be higher or lower. Please contact us for a full copy of the Ashland report.